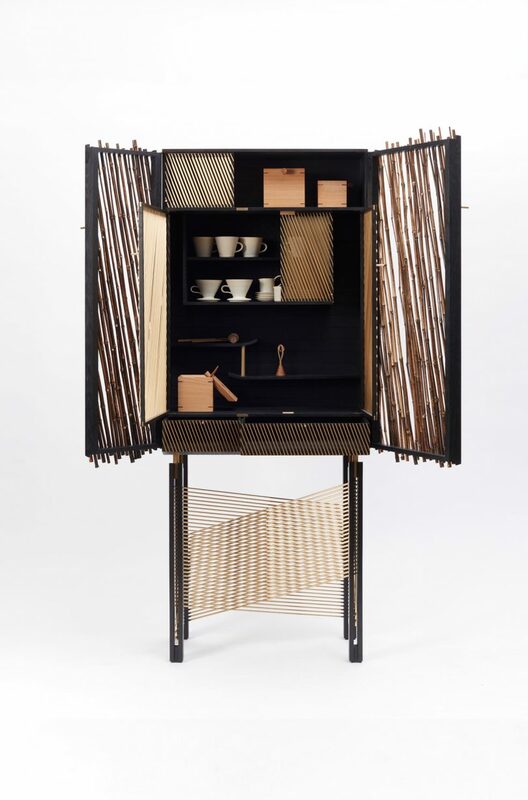 A labor-intensive drinks cabinet that reveals a traditional coffee set through openings in the bamboo doors. Hugh Miller Furniture spent approximately 1000 hours hand-making the ‘In Shadows’ Drinks Cabinet which debuts during the London Design Festival. The labor-intensive piece combines Japanese bamboo, solid brass rods, and British elm wood that’s been stained with black Japanese calligraphy ink, resulting in cabinet that focuses on craftsmanship. The cabinet’s name comes from the Japanese essay ‘In Praise of Shadows’, a piece on Japanese aesthetics with a part about lacquerware and how it’s designed to be seen in dim light. The diagonal bamboo pieces on the doors along with the diagonal brass rod screens cleverly disguise a Japanese coffee set, by Japanese ceramicist Saiko Fukuoka. The set can be seen within the shadows and light that filter through the gaps. ‘In Shadows’ came about after a trip to Japan that immediately resulted in a collection called The Coffee Ceremony. Since that initial launch, he’s been incorporating new materials and methods which led to this unique drinks cabinet. ‘In Shadows’ will debut at the Design-Nation stand at Decorex International during the upcoming London Design Festival.